Just like before, I used acrylic paint mixed with floor paint for my color. 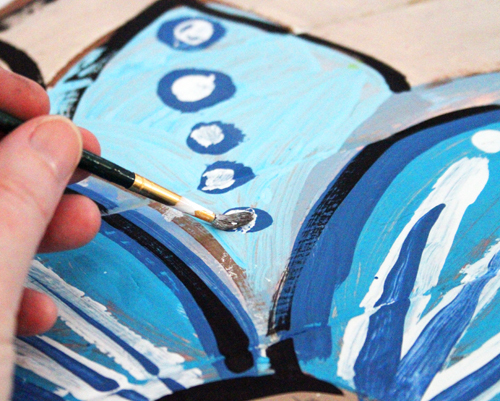 I added lines and details but not as many I typically add when I am working on a painting or drawing full of pattern. For this project I wanted to keep my lines loose and imperfect. 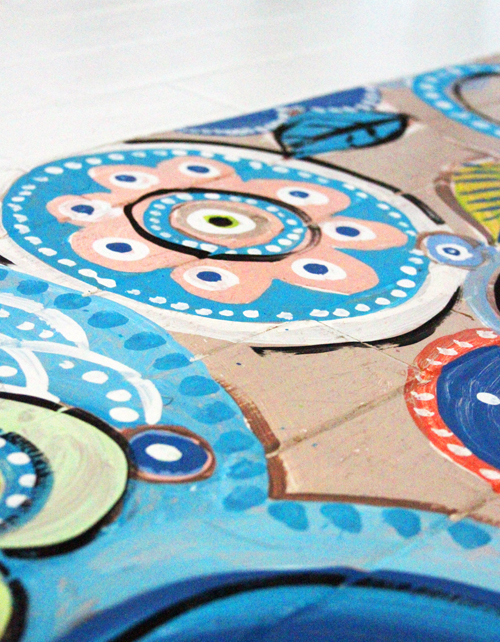 I love painting surface pattern (one of my favorite things to create) but again, like I shared last week in this project painting lots of pattern can really take a lot of time and patience! but nothing (not my belly in the way or the amount of time it took) was quite as challenging our cat Jack walking in and out of my wet paint! I sealed it with a really light and thin layer of Minwax polyurethane in a satin finish. I wanted to seal it but also didn't want a lot of shine and I also look forward to it wearing, fading and getting worn over time. 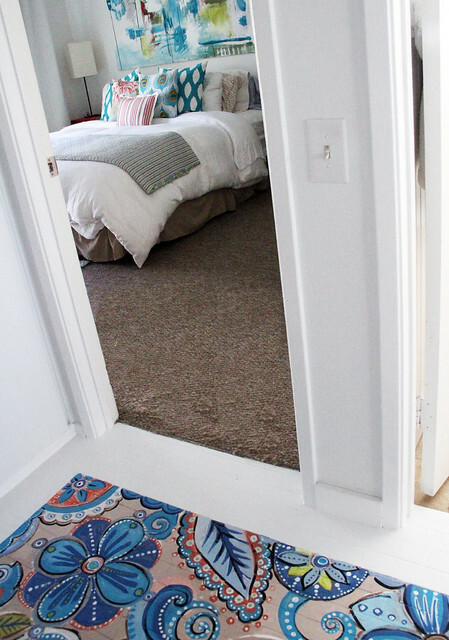 The end result is a fun whimsical floor that leads you into the bedrooms. Just awesome of course!!! Woo baby your hair is growing! You look beautiful mama! I am planing a wee floor project and this gives me a little kick to get going! Thank you! I stopped following for a time but I read now you're pregnant! I very much love this painting. 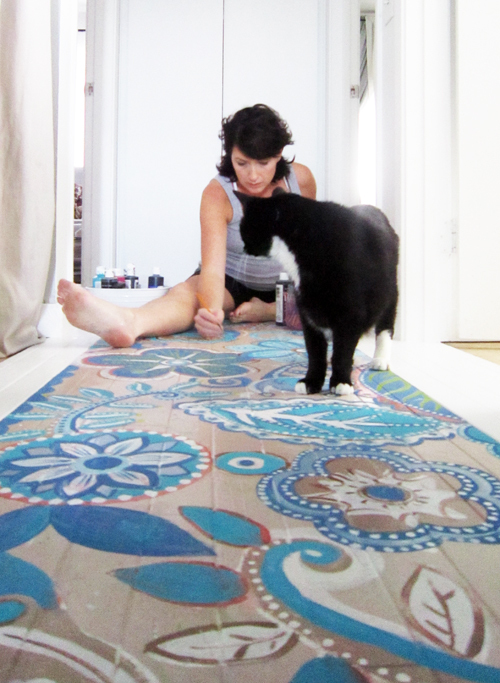 I love your painted floor ! it's so fun and makes you happy as soon as you come into your house ! Love it! Love the painting above the bed! Too perfection - all the way down to the bottom of the post and the red shoes! You absolutely amaze me. And the floor looks amazing also. i am new to your bloggy and am lovin all the inspiration here. It's so beautiful! Cats just know where you don't want them don't they. You've got a great eye for scale! I would love to do this in my rental - but I'd get kicked out. 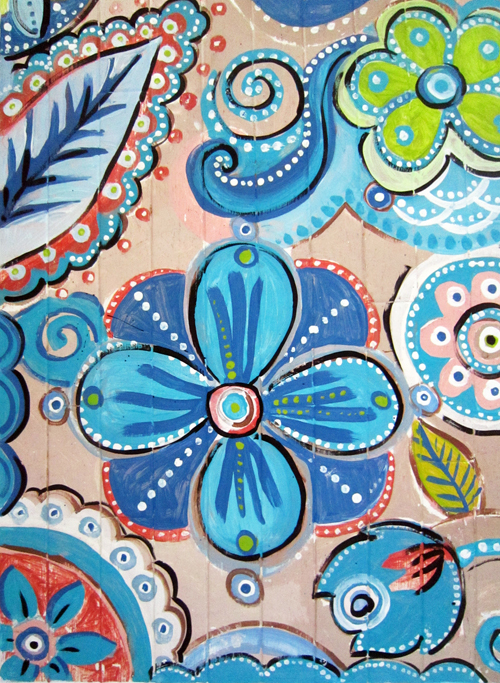 I will, however, try it on the painted wooden doors (OLD doors). This is beautiful! How great to make your space so special with a personal touch. just amazing, alisa, i love it. totally unique. and your cat is the complete double off my own little one, right down to the white chin! WOW! When I'm older I want to pant my floor! That is soooooooo cool! This reminds me so much of painted wood from, for instance, Bulgaria or Romania but also of the traditional 'roses and castles' painting on English canal boats. 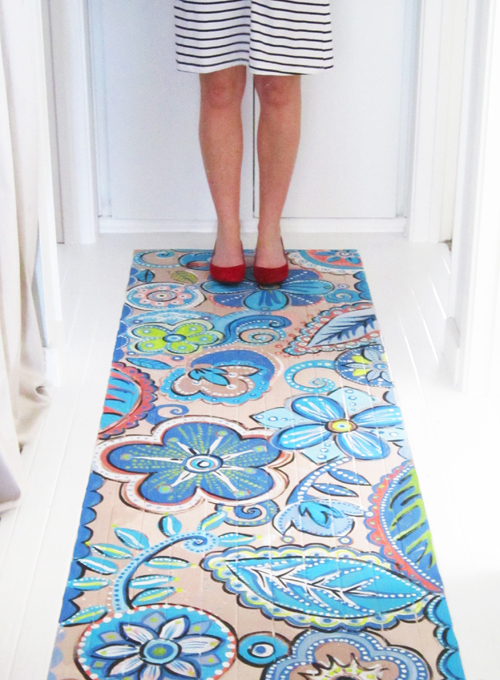 Love the makeover of your wooden 'runner'. So vibrant! 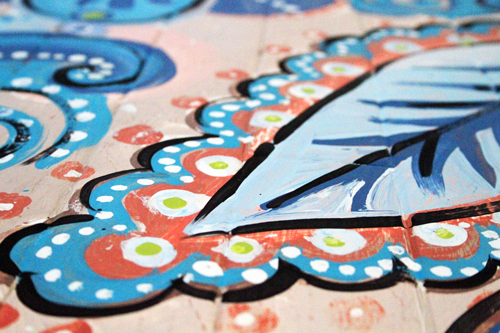 Totally get that pregnant nesting thing: I was so inspired and creatively productive during my pregnancy it was silly! That is SO amazing! I want to do this in my daughter's bedroom! You'd think that a little wet paint sticking to his paws would teach him a lesson - hahaha. My cat would probably not only walk across it but lay right in the wet paint! Sheesh. Definitely something to keep in mind if I paint my daughter's floor. Wow! Your this looks so perfect! You've done an amazing job, considering the difficulties with you being pregnant and all. You are so talented and you just make beautiful whatever you touch! CONGRATULATIONS! Can I asked what kind of paint you used and/or did you coat it with something afterwards. Looks fabulous! gorgeous, gorgeous!!! Love the colors and you look so cute with your baby belly! it looks great, Alisa, my compliments! it's gorgeous. you are so inspiring. I liked it before, but love the re-do! This is going to provide awesome stimulation as the baby is crawling and toddling around on it. What a gorgeous floor! Love your detailed description of the process. I love, love, love this floor! I hope to one day be brave enough to have floor like you do. Love it. And I know it will look even better when worn out a bit. I have been thinking about doing a painted floor in my soon to be studio. The floors are in horrible shape so I thought painting might spruce them up a bit. May I link back to your post on my blog if I get this done? You are such an inspiration! удивительно красиво!!! отличная идея и отличное воплощение! love it .. you're so great .. so fantastic .. Gorgeous!! Now you've got me thinking about painting all my walls and trim white so that the artwork and accessories really pop in the space. I think your bright and cheery painted floor, looks modern and artistic in your all white environment. Like art in a gallery! This is fabulous- just gorgeous! I love the 7th photo down in your post - it captures that moment in a big project at which I think "This is the best idea I wish I never had!" LOL! Glad you persisted - the final product is absolutely stunning. Thanks for sharing! I like so much your work, it´s fantanstic and very creative. This is so cool! We are military - so we can't do that to our house, but it's first on my list. Your blog has really inspired me to doodle more. I used to love doodling but just kind of quit. I love the idea of turning my doodles into real art! That is lovely as is your house, Alisa! And you look lovely too...congratulations! 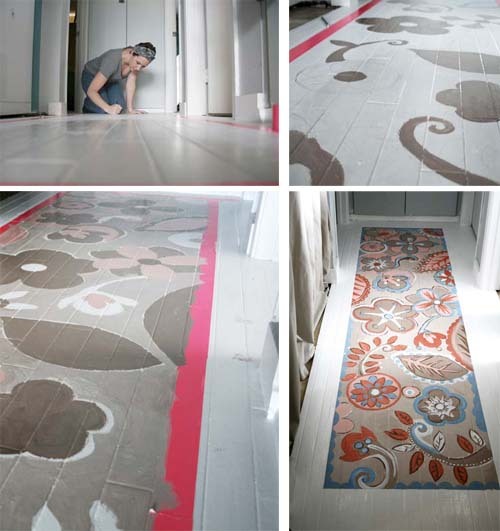 First, that floor painting technique could be done on canvas cloth for those who do not or cannot paint your floors. Second, what white paint colours did you use for your house? We are currently repainting our house in cream with white trim, but I would love to know your paint colour choices! Well, I have to admit that I normally do not like the idea of painting wood floors. BUT when I just opened up this post and saw the amazing photos, I just thought: “Wow, this is quality”. I love the new colors and all nosy cats of course. Congratulations! That was great! Very creative, unique style of floor. Now, I wish I can do the same also. Absolutely love it. Time well spent. I'm sure you've gotten nothing but excellent feed back but I just wanted to share mine as well ;0). Your patience, creativity and talent definitely paid off here. This is a wonderful idea indeed. 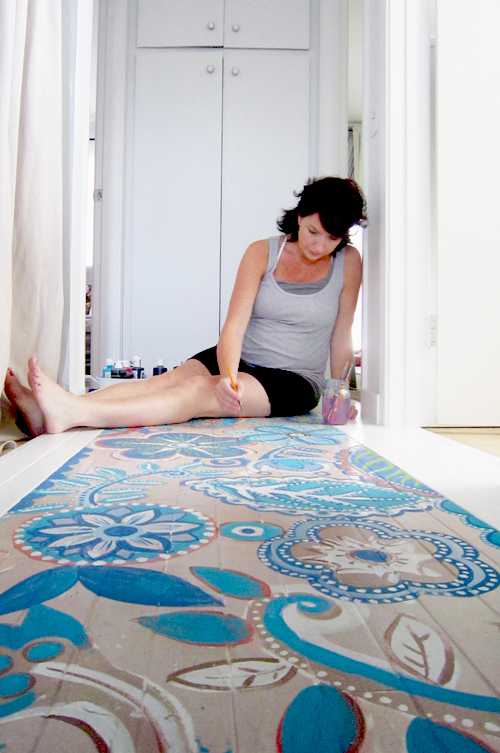 Painting floors with only one color is a thing of the past and this post goes to show why! Being in the flooring Houston industry, I am glad to see lovely flooring systems made even better with ingenuity. I have been following your blog for nearly two years. I love how willing you are to share your art...I feel too guarded to let others view mine. I work as a therapist, and love working my art in the form of emotional connection and processing and healing. Blog and content in this section of the website are really amazing. What a great artistic taste you have! 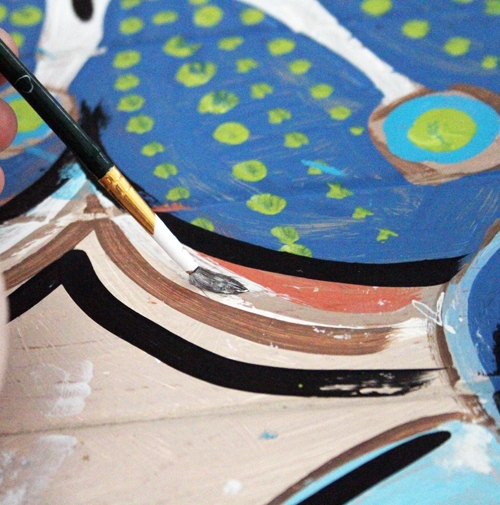 Real artists do have a lot of patience to wait for the grand results without the fear of losing it overtime. And what’s more amazing in this is that, you did the design even if you were 7 months pregnant! Visual arts such as the one you just shown are really helpful ways on how one can really express herself from time to time. 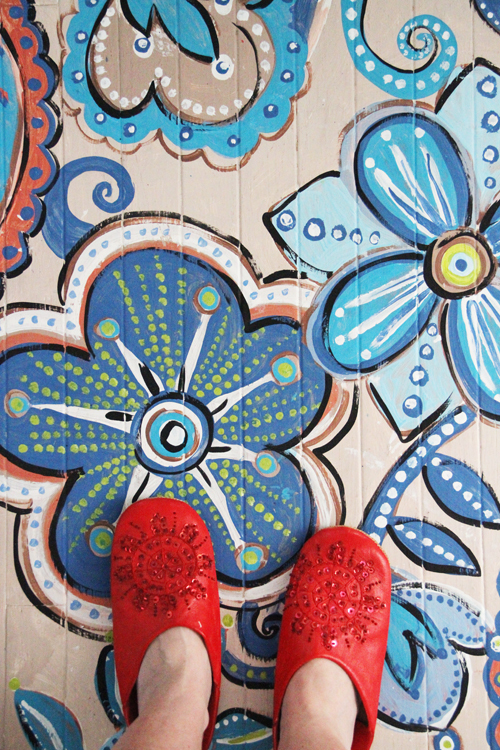 Painting your wooden floor is definitely a good way of personalizing your space. Colors can definitely brighten any room. 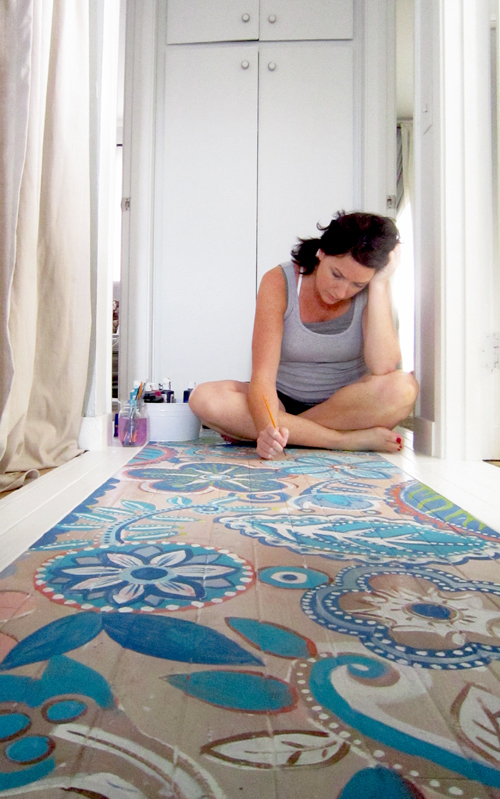 If you want to do this on your floor, it is best to have a solid color for your walls so that the focus would be directed to your masterpiece. However, a traditional brown wooden floor is a classic choice for any type of home! awesome painting on the floor. Really looking very beautiful. You are really a true artist.. This is just incredible. It certainly required some work but the end result is just worth the time and effort. This is indeed a very artistic way of adding a twist to the interior design of your home. Thank you for sharing this post, this really serves as a great inspiration. It did stir my imagination! I like so much your work, it´s fantanstic and very creative. it looks absolutly gorgeous i love it. Wow, your wooden floor is looking amazing after the paint job, thanks for sharing this wonderful post with us. It is a very nice and informative article.The design in this picture on the floor is the nice piece of art.Wood flooring is become very popular now a days.It is a unique idea to design your house according to your desires. It is a hard thing to stop the journey wood flooring in this current scenario.No one can replace the Wooden flooring with any kind of PVC. wow!!! it takes a good artist to complete a project like this! This is a way to make your flooring unique. but you may need to take extra care because paints usually fade after a certain period. It is strongly believed that hardwood flooring can raise the value of your home with higher appeal to buyers should you be fitting wooden floors to resell your home. They are affordable and maintain their value. Que ideia maravilhosa! Obrigada por compartilhar. Inspirou-me a fazer o piso do meu terraço que é todo azul, parede, teto, portas, só falta o piso, e achei que ficaria ótimo pintado assim. Percebi que o seu piso é em madeira, o daqui é cerâmica, que tipo de tinta usaria? Esmalte? Própria para piso? (Há poucas cores) É preciso algum tipo de verniz para não danificá-lo? Por favor responda, já penso nas cores - vários tons de azul e um pouco de branco. Adorei seu blog. Parabéns pelo que realiza. Well that is an amazing idea to paint the wood floor and I guess painting wood floor is bit easy that painting cemented floor. Great details you've gone into concerning French Oak Flooring. The pedigree of the product speaks for itself. The provenance of knowing that these slow growing, high quality trees are also a pivotal factor in the desirability of this quality of wood. I'm trying this on the ceiling of my front porch. Amazing, really effective service of wooden innovating you described here. Good blog. I loved greatly. Thanks for posting this informative article thanks for sharing your great post. Contents with this website usually are very good as well as appreciative. Wow...nice job. I love it and I love the colors. Very thorough and informative article related to Houten Vloeren Den Haag! Thank you for sharing this information. interior designers make for customers, including cabinets, ground surface, counters, and apparatuses. They utilize their aptitudes to decide a customer's venture objectives, get ready last arranges and make a course of events for the undertaking. inside fashioners must ensure the are practical, helpful, agreeable, and up to construction see. On the market today, the demand for beauty apartment by this method is very large. Due to the many advantages of the material, aesthetic and functional use of this type are so many homeowners choose priorities.